When it comes to dispatch software, one word reigns supreme: organization. The speed and quality of dispatching operations boils down to preparation and how good your current organizational system is at keeping up with your demands and recurring scheduling needs. 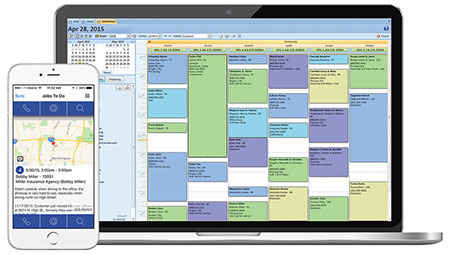 Smart Service maid service dispatch software allows you to schedule, dispatch, send work order updates, track teams in the field, collect electronic signatures, and manage customer information all in one place. Because Smart Service is a QuickBooks integrated software, all of your data is at your fingertips. Why use a dispatch software that doesn’t talk to your billing software? By bridging this gap with Smart Service, you cut down on time spent transferring and double entering information. Names, addresses, specific instructions, and additional notes are all transferrable pieces of data that your (and your crews) have access to whenever you need them. You can add and change information at any time! From a change in address in the office while on the phone with a customer to a signature collected by your crews throughout the day, Smart Service maid service dispatch software keeps you organized. Navigating a crew without a mobile app like Smart Service can lead to missing information, trips back to the office, phone calls, paperwork, and more. But using our mobile app in the field changes the game entirely. When a job appears on the mobile app, your crew will have access to that customer’s address, job specifications, notes, routes, and any other pertinent information. Your crews can call or email customers to update them on arrival times, use GPS routing to find the best paths, and collect signatures if needed that will automatically show up on the customer file for your dispatchers to see in the office. The Smart Service mobile app works as a great tool for the office as well. In addition to practically eliminating paperwork, the app has multiple tracking features that make things like scheduling easier. If you’re on the phone with a customer that needs you to swing by ASAP, you can see exactly where each of your crews are as well as their schedules for the day to see if anyone is able to pick up the assignment. You can also track how long each crew spent at each specific location, their mileage, their breaks, and more. The Smart Service mobile app takes maid service dispatch software to a new level. Maid service dispatch software puts your business first, to streamlining processes from beginning to end. Request a free demo of our maid service software!